Dishes made from salmon, tasty, useful and dietary. This fish contains protein, minerals and fatty acids which are necessary for normal functioning of the body. Besides, in the little salmon bones, which makes the process of cooking very easy and enjoyable. To cook delicious salmon tempura will not be easy: it's simple and fast enough. The main thing is to follow the recipe and proportioning. Fish wash, remove the scales and bones, cut into small pieces, salt and pepper. Prepare the batter for pink salmon. Knead the dough from eggs, flour and milk. So the dough is homogeneous and without lumps, use a food processor or blender. 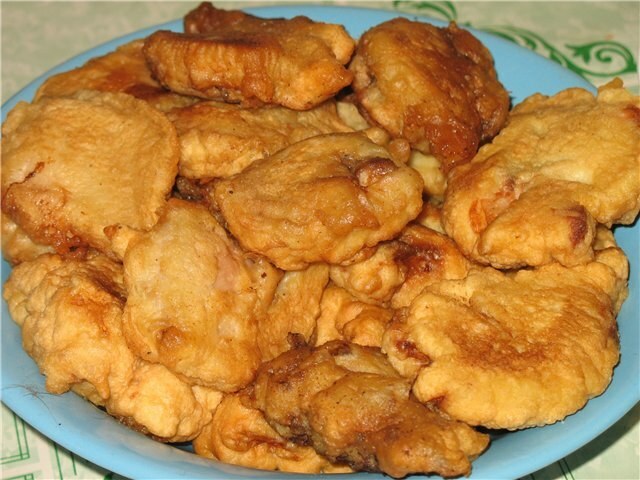 Roll the pieces in batter and fry them in a pan, plentifully watered with vegetable oil until Golden brown. Serve the fish with a garnish or a separate dish. Steam salmon – easy, tasty and succulent dish that is prepared with no added oil and retains all the vitamins. Fish fillet wash, cut into pieces, RUB with salt and pepper. Parsley, dill or other cooked greens chop. In the bowl of a double boiler put the salmon, sprinkle with herbs and cook for 25 minutes. Prepare the sauce by mixing olive oil and lemon juice. Pour evenly over the finished fish. Steam the salmon can be served with mashed potatoes. A delicious and hearty entree is obtained from the pink salmon. The main secret is to cook the fish whole, with skin and bones, and only at the end to separate the pulp. Then fish turns out tender and the soup is thick and moderately thick. - sweet pepper, 1 piece. Cut potatoes into julienne, cook for 10 minutes. Cut the salmon head, tail and fins, clean off the scales. Finely chop onion, carrot, pepper, celery, fry in a pan adding vegetable oil. When potatoes are almost cooked, add fried vegetables and a whole fish. After 10 minutes turn off the stove, remove the salmon, loosen the flesh from the skin and bones, return the pot of soup. Top sprinkle with finely chopped greens.